Rapid advancements in Information Communication Technologies (ICT) over the past 20 years has substantially altered the ways in which people live, work, play and interact with one another. The World Bank’s World Development Report shows that ICT has a positive effect on a country’s economy, with a 10 per cent increase in broadband penetration being associated with a 1.4 per cent increase in Gross Domestic Product (GDP) growth in emerging markets. 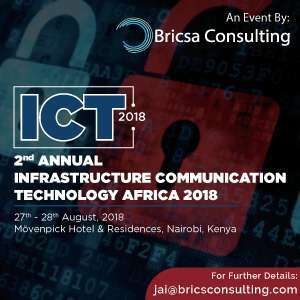 The 2nd Annual Infrastructure Communication Technology conference, which is taking place during 27th & 28th August, 2018 at Movenpick Hotel & Residences in Nairobi, Kenya will host speakers from dedicated government bodies for ICT across Africa who will provide insights about initiatives, projects and developments happening in the ICT sector. The conference focuses on the developments and application of Artificial Intelligence, Cyber Security, Internet of Things, Fintech, Telecom, Smart Cities, Blockchain and other upcoming disruptive technologies in sectors of Healthcare , Education, BFSI, Agriculture, Communication et al. , as well as, exploring the opportunities for expansion in the African region considering the initiatives, programmes and projects undergoing or in the pipeline by private enterprises, government entities and public & private partnerships. Come join us as we explore the African markets and understand how the ICT sector impacts the African economy as well as interact with the influencers and decision makers of the industries. Identifying market drivers, challenges and insights on policy implementation initiatives, programmes and projects. The impact of ICT developments in GDP of African countries’ and the need for a comprehensive policy, legal and regulatory framework. The need for Infrastructure that arises due to application of new technology keeping in mind the local environment of African market. The support by government and private entities in the development and application of Artificial Intelligence, Internet of Things, Fintech, Telecom, Smart Cities, Blockchain and other upcoming disruptive technologies in sectors of Healthcare , Education, BFSI, Agriculture, Communication et al. Issues of privacy, cybercrimes, ethical and moral conduct, copyrights, intellectual property rights and privacy. FDI opportunities in Africa in 2018.